Jamie Oliver and other brand named products are popular corporate gifts. These personalised products are effective in leaving a lasting impression on your clients and are sure to boost brand recognition and recall especially when printed with your brand name or logo. ACE’s collection of customised brand named items includes personalised aprons and kitchen scales. They make perfect business giveaways to loyal customers and even as incentive prizes to top employees. Call us today to know more about our promotional merchandise! 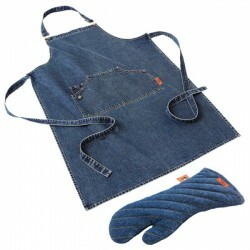 Jamie Oliver apron with adjustable strap, Extra long denim glove, Supplied in Jamie Oliver packaging. Accurate kitchen scale that can carry up to 5 Kg. Measures per gram or ounce. Automatically switches off when not used. Features an alarm function for low power or overloading. Includes 1 x button cell battery.